Frontpage Interview’s guest today is Kenneth Levin, a clinical instructor of psychiatry at Harvard Medical School, a Princeton-trained historian, and a commentator on Israeli politics. 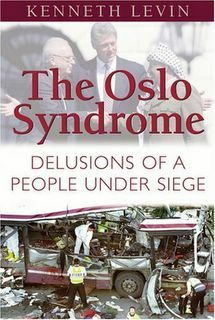 He is the author of the new book The Oslo Syndrome: Delusions of a People Under Siege. FP: Dr. Levin, welcome to Frontpage Interview. Levin: It was obvious to me at the start, as it was to many others, that the Oslo agreements could only lead to disaster. I said as much in a Jerusalem Post op.ed. a few days before the 1993 signing of the first accords on the White House lawn. That there was something very deluded about the thinking of Israel’s leaders and their pro-Oslo constituency became more evident as Oslo proceeded. Arafat and his Palestinian Authority immediately used their media, mosques and schools to promote hatred of Israel and violence against Jews and continued to make clear their objective remained Israel’s destruction. The level of terrorism increased to unprecedented dimensions. Yet Israel responded with more concessions.